From HR and payroll to compliance and talent management organizations within the real estate realm need a unified a single-source solution. When it comes to human capital management (HCM) needs, the real estate industry is uniquely poised to take advantage of a variety of functions to better manage their workforce. Leveraging a unified HCM solution, industry leaders can take advantage of higher levels of speed, control, and flexibility, especially when managing thousands of employees across hundreds of locations. This toolkit looks at three industry leaders and the benefits they are experiencing by switching to an all-in-one people management solution. Discover how a best-in-class solution can benefit your organization. 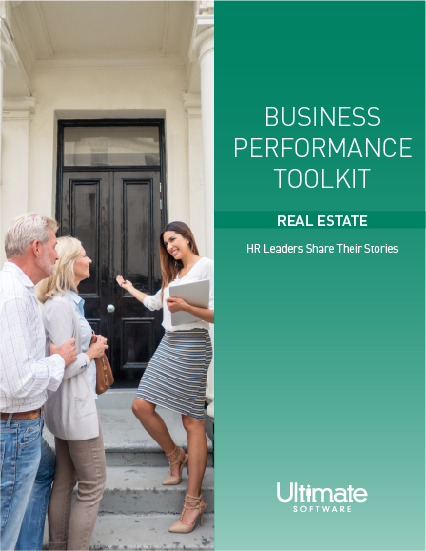 Read the full article below or download a printable version of the Business Performance Toolkit for Real Estate organizations. How can Comprehensive People Management Solution Help? When it comes to human capital management (HCM) needs, the real estate industry is uniquely poised to take advantage of a variety of functions to better manage an evolving workforce. From HR and payroll to compliance and talent management, organizations within the real estate realm need a unified a single-source solution. It’s vital that organizations are up-to-date on changing compliance trends in all locations they manage properties and that their people can access information they need, regardless of where they are. Often having locations throughout the country or internationally, companies within the real estate industry also need a comprehensive solution that supports business intelligence reporting as well as mobile capabilities for immediate, role-based access to information from any location. By leveraging a unified HCM solution, industry leaders can take advantage of higher levels of speed, control, and flexibility, especially when managing thousands of personnel across hundreds of locations. These benefits lead to happier managers and more engaged employees. This toolkit looks at industry leaders and the benefits they are experiencing by switching to an all-in-one people management solution. Discover how a best-in-class solution can benefit your organization. Western National Property Management (WNPM) manages more than 23,000 units throughout California, Utah, and Nevada. The company is an arm of Western National Group, a fully integrated multifamily acquisition, development, construction, and property management firm. WNPM was frustrated with the limitations they encountered with the payroll service bureau and in-house payroll application they had been using. The company’s previous systems lacked the business reporting, functionality, and flexibility that required them to take its workforce operations to the next level. The firm began a search for a new vendor that could provide a comprehensive solution with end-to-end functionality for HR management. Ken Hodges, WNPM’s vice president of IT, reports that since going live with a cloud-based solution, the company has identified and addressed specific workforce issues before they escalate by using detailed reporting. Hodges’ team also has bridged technical gaps between the HR and payroll departments as well as leveraged flexible set-up with hundreds of business rules that are applied automatically. Before, their employee services teams had difficulty generating certain reports because they didn’t have a real-time reporting tool that could integrate the two different systems for HR and payroll. With a comprehensive HCM solution, data and processes are connected in one solution, and users can run standard reports or create up-to-date, ad hoc analytics in minutes. Having all employee-related data centralized in one solution has resulted in multiple time-saving benefits. Managers can view complete details about their staff—such as compensation history, performance review dates/results, job and training histories, and more—all without contacting HR or payroll. Employees can make requests for vacation time, print W-2s, and view their current or historical pay details. “We have employees in many locations. Previously they needed to contact HR and payroll, sometimes outside of normal business hours, to get questions answered. Now, they can quickly get those answers themselves with employee self-service. Our HR and payroll teams are providing better service while dedicating more time and effort to higher-level activities,” said Hodges. Hodges and his team are minimizing errors and the need for manual intervention with flexibility to manage hundreds of unique issues and exceptions. For example, because employees may work in different divisions in the same pay period, they may receive their salary based on either a percentage of the department or division in which they work or based upon the hourly rate of the job in that particular division. A best-in-class solution can perform these complex calculations and allocations, including those related to worker’s compensation, benefits, and taxes, even if the workers are in different municipalities in the same pay period. Headquartered in Chicago, Illinois, General Growth Properties (GGP) is an S&P 500 company focused exclusively on owning, managing, leasing, and redeveloping high-quality retail properties throughout the United States. Offering a mix of some of the most popular and unique retailers in the world. One of GGP’s defining elements is its strong company culture, with employees centered at the company’s foundation. Kathy Stover, director of human resources at General Growth Properties, regards people as the primary force of the business. Cloud-based people management tools provides organizations with a full suite of HCM functionality, highlighted by an extremely accessible user experience. According to GGP, a contemporary user experience has led to increased adoption, productivity, and collaboration among employees, managers, and executives. Many organizations rely on several systems to manage, track, and plan a range of HR, payroll, and talent management operations. This often leads to increased complexities, inconsistent or inaccurate data, and ongoing business challenges. HHHunt is a diversified regional leader in real estate development, building and management with residential communities in Virginia, North Carolina, South Carolina and Maryland. With primary offices in Virginia, and Raleigh, NC, HHHunt employs over 1,900 people in the areas of community development, home building, apartment development/management, senior living development/management and community management. Prior to switching to an all-in-one solution, the company used construction-accounting software to process its payroll, and a separate system to manage benefits. The separate housing of payroll and benefits data made even limited reporting a challenge to produce. As a company dedicated to growth, with 90% of the company’s profits reinvested into the business, HHHunt recognized that a modern HCM solution was a critical part of its future. The company sought to consolidate its systems, gain access to robust and in-depth business intelligence, and optimize its recruiting and onboarding process. According to McHugh, the company’s unified data in the solution, plus the ease with which managers can run reports, has also removed manual, time-consuming tasks from HR. With these and other resource savings delivered by a comprehensive solution, HHHunt has been able to follow through on its brand promise to be employee-centered, committing to the well-being of each employee. In the real estate industry, there is a good chance that your people are in multiple municipalities. And it is necessary to empower your people, keeping your HR and payroll teams free from constant requests during non-business hours. On top of this, you need to ensure that you are staying in compliant in every city, state, and country of operation. A best-in-class people management solution can be the answer you need to elevate your HR and payroll departments, while giving your employees role-based access, whether they’re in the office or on-the-go. Industry leaders are already seeing a huge return on their investment, and there's never been a better time to explore your options. Streamline, consolidate, and enhance your payroll processes to maximize strategic impact. Capture real-time employee information based on a plethora of demographics to stay at the forefront of industry trends. Easily integrate with third-party systems, including point-of-sale systems, 401(k) providers, and more. Manage your global employees’ HR/payroll data from anywhere with 24-7 online access. To learn more, watch a brief overview tour and click here to download the Business Performance Toolkit Whitepaper for the Real Estate Industry. Please fill out this brief form to access your real estate toolkit.